Privatisation of Da Lat–Trai Mat railroad? The Ministry of Transport has asked the central Government’s approval for privatisation of investments for restoration of infrastructure for the Da Lat – Trai Mat Railroad. Khuong The Duy of the Ministry of Transport asked permission from the Prime Minister to seek private investments for the railroad in Lam Dong Province under the BOOT (Build–Own-Operate–Transfer) form. The railway section is part of the 84-km Thap Cham – Da Lat Railway, which was suspended in 1968 during wartime. 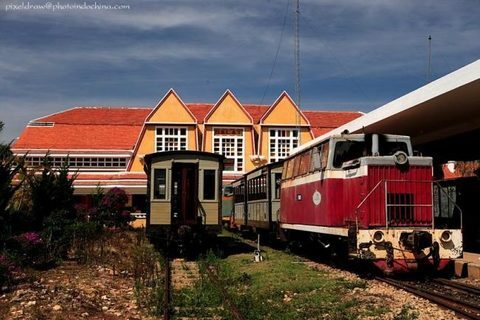 In 1991, the 6.7-km section of the railway, which runs from Da Lat to Trai Mat, was restored to serve the tourism industry. This stretch has been operating independently and is not connected with any railway network in the region. Duy said the state had earned VND196 million (US$87,210) in operating fees from the railway section, while spending VND2.4 billion for management and maintenance services per year. A spokesman for the Ministry of Transport said that private investment was necessary to maintain the railway and to contribute to tourism development in Da Lat. Such funds would also help the state cut management costs and earn more money from the operation of Da Lat Railway Station. The proposed BOOT project has total investment of VND79.2 billion (US$3.5 million). The investor will be refunded in 25 years through train tickets and operation of facilities at the two railway stations on the railroad. If the proposal is approved by the Prime Minister, the Viet Nam Railway Authority will complete procedures so that a tender to select the investor would be held by the end of the year, according to Duy. The Transport Ministry spokesman said that the proposal was supported by several agencies, authorities and Lam Dong Province People’s Committee.